Hot air ballooning is an unparalleled and unforgettable experience. What could be a more thrilling way to enjoy a hot air balloon ride than in a Napa Valley tour? The Napa Valley is an area near San Francisco, California where some of the most world-renowned wines are produced. The landscape in Napa Valley is certainly breathtaking, and it seems everything you see in the valley is quite picturesque. There are many ways to appreciate Napa’s peerless natural landscape. You can drive through the valley, or bike on the hillsides. But the best way to experience the thrill of your Napa Valley tour is on a hot air balloon ride. Hot air ballooning is an ideal activity for anyone. For the adventurous, it would be a whole new experience for them, it feels as if they were touching the sky and flying in the heavens. For those who are afraid of heights or flying, they shouldn’t be bothered by riding in a hot air balloon. The balloon’s slow and gentle liftoff will put them at ease. A hot air balloon simply flies along with the wind, rather than being “beaten” by it. A hot air balloon ride will give those on the trip a sense of peace and tranquility. The normal altitude of a hot air balloon is in the air range from 1,000 to 3,000 feet. This is the ideal altitude because although you can see things from a distance, you’re still able to view the scenery on the ground. The concrete jungle gradually fades from sight, and what you’ll only see are the varying shades of green from trees such as oak, bay, and eucalyptus, and of course, the neat endless rows of vines bearing those precious grapes. You will definitely want to bring your camera to capture some of Napa’s magnificent vistas that unravel before your eyes as the hot air balloon floats along the cool, crisp morning breeze. When it comes to choosing someone to provide you with the best hot air ballooning experience for your Napa Valley Tour, no one provides better hot air balloon rides than Balloons Above the Valley (BATV). The company is one of the first to provide hot air balloon rides in the Napa Valley, and they take pride in its top quality customer service and emphasis on safety. 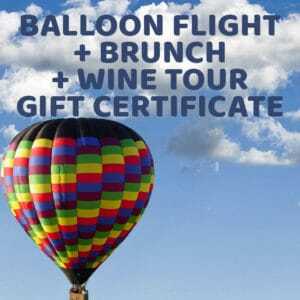 BATV offers attractive hot air balloon ride and wine tour packages that include transportation (by limousine and ferry), a visit to the wineries, pre-flight breakfast, post-flight brunch, and of course the hot air ballooning that will easily become an unforgettable highlight of your Napa Valley tour. For more details about the hot air balloon packages and their rates, call them at 800-464-6824.